It looks like I've gotten into some kind of Jack-O-Lantern mode lately, from my bento lunches to my home decorations. We have a wooden doll house or, since Nikolai uses it for his collection of bears, perhaps I should call it a bear house. My hubby made this cute little bear sized house for Nikolai many years ago. It has three stories with different flooring in all the rooms from carpet and marble to wood with a beautiful roof top, and fully furnished. Several weeks ago I spotted some adorable little pumpkin shaped string lights, got them for the bear's house, and used them to decorate it along the roof and in one of the rooms! For this lunch I made a simple and free hand cut sandwich into a Jack-O-Lantern. 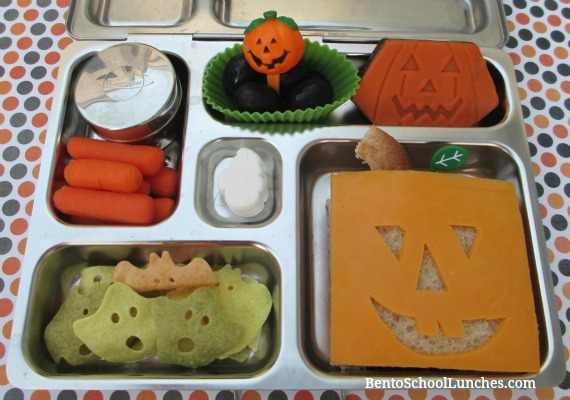 In this bento lunch: Main compartment contains a sandwich topped with mild cheddar cheese carved into Jack-O-Lantern with a bread crust stem and a leaf food pick. The sides are some ghosts and bats veggie chips which I purchased from Target, a ghost marshmallow in the center, organic baby carrots with hummus in the small dipper, a brownie and some seedless grapes in a silicone cup with a Jack-O-Lantern pick. This lunch was packed in a Planetbox rover. Love this lunch! And the bear house sounds adorable! Love this and that doll house sounds so amazing!